In this experimental module you will use yeast to express and display antibody fragments. Antibodies are amazing proteins, capable of recognizing almost any foreign substance we encounter. The overall structure of every antibody is identical. They are made from four polypeptides: two “heavy” (i.e. longer) chains and two “light” chains. The four chains assemble into the hallmark “Y” shape, with a disulfide bond holding each light chain to a heavy chain and another disulfide bond linking the two heavy chains. Yet each antibody has a unique “variable” region, at the tip of each Y, allowing for a specific interaction with a particular antigen. 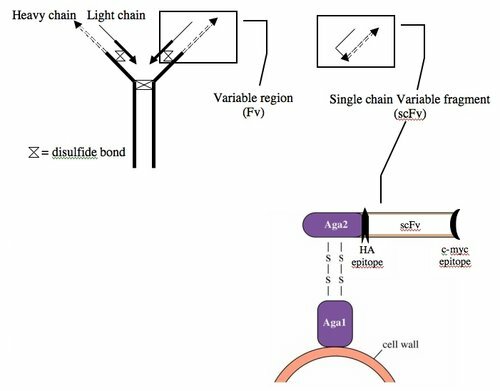 The variable region, called Fv for “variable fragment,” is defined by the sequences at the tip of the heavy chain and the tip of the light chain. You will be working with genetically engineered yeast that can display Fv regions on their surface, no small feat for a yeast since evolution has never required that yeast learn to make antibodies! To ease the task a little, the variable region of the light and heavy chains have been linked into a single polypeptide chain. Remarkably, a yeast cell can cram up to 100,000 copies of the single chain variable fragment (scFv) onto its surface. To display the scFv protein on the yeast surface, a protein fusion was made between the scFv sequence and Aga2, a part of the a-agglutinin receptor that yeast normally express to help them mate. Two polypeptides, Aga1 and Aga2, are disulfide bonded to form the a-agglutinin receptor, with Aga1 embedded in the yeast cell wall. The Aga2:scFv fusion is expressed from a plasmid and the product is exported to the cell surface. It is anchored and displayed through disulfide links to the Aga1 protein. Two additional sequences were engineered into the fusion. A short sequence called the HA-epitope was placed between the Aga2 and the scFv proteins, and another short sequence called the c-myc epitope was engineered at the C-terminal side of the scFv. Since these epitopes can be detected with commercially-available antibodies, they are useful for quantifying the amount of fusion protein at the cell surface. The yeast surface display system has been used to study protein:ligand interactions. Screens of antibody libraries have identified variants of pCT-CON that bind interesting ligands. 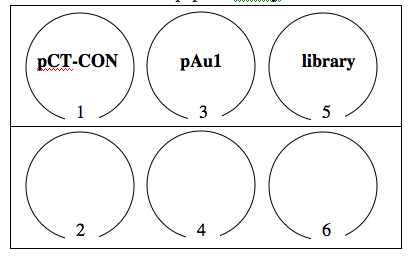 Some of the novel pCT-CON variants that have been isolated bind other proteins (e.g. lysozyme, or the tumor antigen c-erb), others bind small molecules (e.g. fluorescein), and others even bind metals, as you will see today. Once a novel binder has been isolated, it is possible to mutate it further to identify new variants that bind with even greater affinity. This “affinity maturation” approach has been used to increase the affinity of one scFv:ligand interaction four orders of magnitude, changing the time required for the complex to dissociate from seconds to days! (Boder, Midelfort and Wittrup. PNAS 2000 97(20):10701-10705 ). 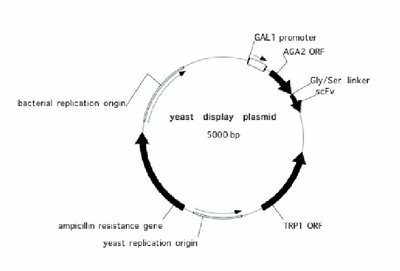 Today you will work with a yeast strain bearing either the original pCT-CON plasmid, that expresses an Aga2:scFv fusion that does not bind gold, or a variant called pAu1 whose AGA2:scFv product was selected based on its gold-binding ability. You will also screen a library of 36 base pair randomized sequences that are fused to Aga2 to find ones that bind to gold (the chemistry and math behind this part of the experiment will be further explored on Day3). Some of the work for this experiment has already been done for you. Two nights ago, the yeast strains needed for today were grown to saturation in glucose-containing media at 30°C. A lack of tryptophan in that media insures that all the yeast carry the pCT-CON, pAu1 or library plasmids. Yesterday, an aliquot of the cells was moved to fresh media (“subcultured”). This time galactose containing media was used to induce display of the fusions. The cells on your bench have been grown at room temperature for at least 20 hours. 1. Prepare the gold slides for study by incubating them in Blocking/Binding Buffer. Wear gloves when you handle the slides and touch only the edges. Place a 6 mm x 10 mm slide into the top three wells of a six well dish, shiny-side up. Add 2 ml Gal Blocking/Binding Buffer to cover the gold slides. Place the dish on the rocking shaker set at speed 7 and let it rock there for at least 10 minutes. 2. While the gold slides are blocking, move 5 ml of each strain to a 15 ml falcon tube. Be sure to swirl and fully resuspend the cultures before removing any cells. 3. Harvest the cells by spinning the tubes in the centrifuge 2000 RPM, 5 minutes. 4. Aspirate the media from the cells. You do not have to remove every drop. In fact it’s better to leave a small amount of liquid on the cells rather than risk aspirating away the cells themselves. 6. Aspirate the Blocking/Binding Buffer from each of the gold slides and pipet 1 ml of fresh Gal Blocking/Binding Buffer. 7. Add the cells that you have resuspended into the appropriate well. 8. Place the dish on the rocking shaker set at speed 7 for 30 minutes. During this time you should familiarize yourself with screens and libraries. You might begin by looking at  for starters. 9. After panning for 30 minutes, move the gold slides to the bottom three wells of the six well dish with 2 ml fresh Gal Blocking/Binding Buffer. Use forceps to move the slides, touching only the edges, and wipe the forceps with ethanol between each sample. 10. Place the dish on the rocking shaker set at speed 7 for 15 minutes. 11. Label three Petri dishes that have –trp media. They should be labeled with the name of the sample as well as the date and your initials. 12. Use forceps to move the slides one last time into a new six well dish with 2 ml fresh Gal Blocking/Binding Buffer. 13. Photograph the surface of the gold slides using the digital camera and the WILD® light microscope. 14. Move the gold slides to eppendorf tubes that have 500 μl of sterile water. Vortex each for 30 seconds exactly. Plate 100 μl on –trp Petri dishes. Once all your plates have dried, wrap them with your colored tape and place them in the 30°C incubator, media side up. 15. You can aspirate any remaining liquid from the 6 well dishes and discard them into the biohaz waste. The eppendorf tubes with your yeast and gold slides can be directly discarded into the biohazardous waste. Surface display of scFv fusion? 2. Make a figure of your digital photographs, organizing them in the same order as your six well dish was organized. Be sure to include labels and a short description of the experiment. 3. If you don’t know already, find out why BSA and Tween were included in the Blocking/Binding Buffer. 4. The primary assignment for this experimental module will be for you to develop a research proposal and present your idea to the class. For next time, please describe five recent findings that might define an interesting research question. You should hand in a 3-5 sentence description of each topic and list the reference that led you to each item. The topics you pick can be related to any aspect of the class, i.e. DNA, protein, systems or bio-material engineering. During lab next time, you and your partner will review the topics and narrow your choices, identifying one or perhaps two topics for further research. This page was last edited on 3 May 2007, at 11:54.